From becoming just the second Irish women to be crowned an NCAA Women’s Soccer Champion in Florida to this week returning to Colin Bell’s Ireland squad, there’s a real feeling that things are starting to really heat up for Megan Connolly. 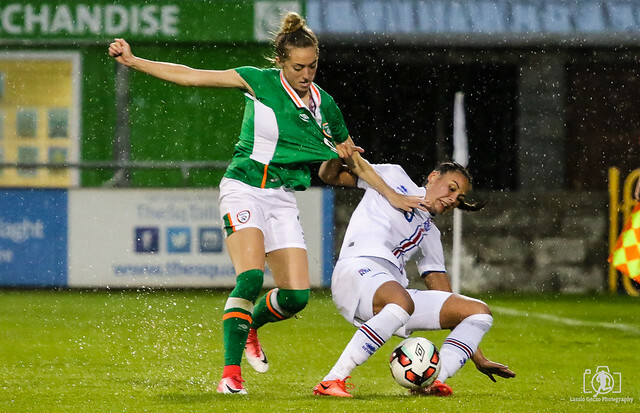 The Corkwoman hopes to this week add another international cap to her name in Sunday’s friendly against Belgium in Murcia, Spain (kick-off 2pm). “It has been a whirlwind of a few weeks with the National Championship success at Florida State, graduating from college and then moving back home to Ireland,” Connolly tells extratime.ie. The 21-year-old had a big decision to make a few years ago when she was offered a four-year scholarship with Florida State University, and a huge opportunity at such a young age to experience life in the top division of the NCAA (National Collegiate Athletic Association). Already a major part of Colin Bell’s international plans at the time, Connolly made a brave and mature decision at 18 to accept the offer from the American University. She hoped a short-term departure from the Ireland set up would stand to her in the long term in terms of her overall development in the game both at club and international level. “It means so much to be back in with the girls and around so many of my friends again,” she says. “It was a really tough decision that I had to make regarding Florida State University and the Irish team. It was never a case where I was given an ultimatum to choose either. “It was down to the fact that I had six months left in college to finish my degree and one last season with Florida State Soccer and I wanted to give my full commitment to achieving the best possible results, on and off the field, while I was there. “I also wanted to give my full commitment to Colin and the girls but I made a personal decision on what would benefit me more in the future. 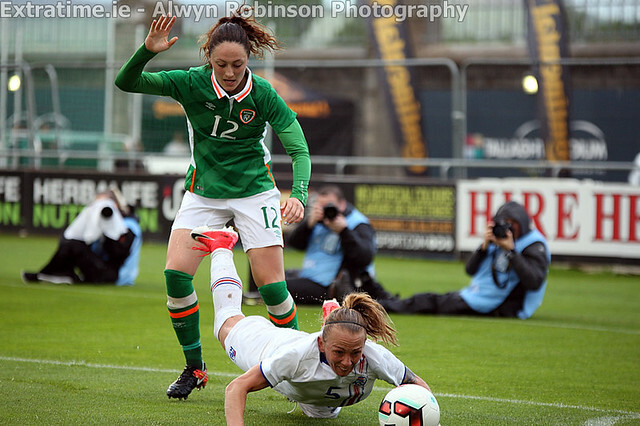 “I had to sacrifice the international side of things for a little while, to be able to achieve success at FSU and then try get back into the Ireland squad and work to be a part of the team on a more permanent basis. Thankfully for Connolly, her decision couldn’t have worked out any better as she returned to Ireland last week as an NCAA Division 1 Champion, her degree completed and a nice phone call from Colin Bell the week she arrived back. Her time in Florida saw her recognised individually, including a nomination for the Hermann trophy, an annual award for the top men and women in the league each season. Ireland teammate Megan Connolly played a major role in attracting Connolly to uproot to Florida State University. “It was honestly the best time of my life,” she reflects. “There is no denying that there were some hard times and periods where I was tested as a player and as a person but I wouldn’t change it for the world. “I grew up so much as a player but mostly as a person. The lessons I learned at Florida State will stick with me for the rest of my life. “I will always consider Florida State a second home and those there as family to me. As a footballer I learned so much about the game and got a much deeper understanding. It was another Irish lady and established soccer player Megan Campbell who pitched the original idea of going to Florida State. “At the time Florida State came into the picture, I was after receiving news of a scholarship opportunity that didn’t go my way at a college in Ireland, which was the only one I would have wanted to go to if it had come through. “That didn’t work out so I looked to go and play professionally somewhere in Europe and not go to college. Connolly opted to stay in the US and finish college despite the distance lessening her options at international level. “That wasn’t a decision I was fully set on so when Megan came along and started talking about Florida State and if I would be interested it was something that really opened my eyes. “After seeing what was available to me and that I would get a degree out of my time there, and at the same time get to play football 24/7, I really couldn’t say no. “It also helped knowing that Megan was going to be there for the first few months, so she really helped me feel welcome there and she was always willing to help me. “If you just look at what Megan has achieved alone, it can be enough inspiration in itself. I have always kept in touch with Megan and I always make sure to remind her of how pivotal she was in me going to FSU. With her degree complete and the young soccer star back living in Ireland what next for Megan Connolly and where next for her in terms of her exciting and rapidly progressing footballing career. “I want to play professional football for as long as I can. I am hoping to sign with a club in the WSL in England in the coming week and then take it from there. Although living in sunny Florida for the last few years, the busy Connolly still found time to keep an eye on her team mates and their results. She’s very confident now she is back involved in the current mix of experience and youth as the team this weekend begin preparations for the start of the UEFA 2021 European Championships in September. “Personally I feel the World Cup campaign taught me a lot about this team and what we can achieve in the future. “Although we didn’t meet our goal of qualifying, we will learn and continue to grow from that experience.